This gigantic Bible recently appeared in my studio. As you can see, it is in three pieces. 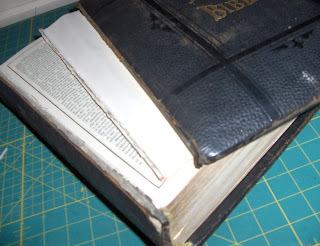 I do not do much book repair because I find it hard on my nerves; however, this belongs to a church and the people seeking its repair are friends of my family... so I agreed to tackle it. The actual publication date is unknown but it was likely purchased in 1927 based on an inscription on the inside. When it arrived, I was very happy to see that the sewing was entirely sound. Phew. To resew this sort of thing, I would require direct word from God before I would even consider it. Reattaching the first few pages and the cover, I could probably handle. The first few pages were easy to reattach. The pages were whipped-stitched together; they were loose sheets rather than a folded section, and I think it was originally just tipped in. So I tipped it in again. 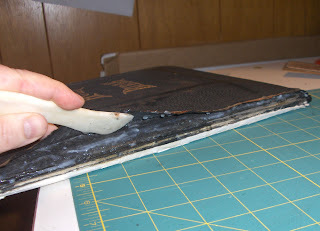 Then I cooked up some paste and started working on reattaching the cover. I couldn't find any material to really match the Bible's original cover. I picked up some strong black cloth and made myself a piece of bookcloth to use - not a great match but it worked. I lifted the cover material along the spine edge of the front cover, and along the edge of the spine and worked my book cloth under the original covering so only a narrow strip of the new material is actually visible. 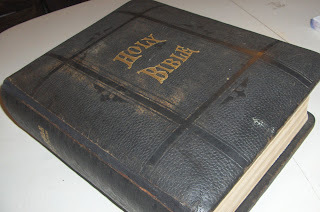 I also used some linen repair tape on the inside and was able to cover it up with some of the original paper used in the Bible so the repair tape isn't visible at all. Now that it is finished, the Bible does seem to be better then when I started. There was an interesting tidbit tucked inside this Bible. This small piece of paper was obviously included when the Bible was originally purchased and explains how to properly open a book. Quite right too, perhaps this instructional bit should be included with books more often. That page is such a fabulous find! I'm glad you took a picture of it and shared it. The Bible looks wonderful! What a great job you did on the Bible. Your courage is greater than mine - I refuse to mend books these days simply because it is too nerveracking. You did a nice job on the Bible and I'm sure it will last another lifetime now. The page on how to open a book is very similar to the talk we were given at college when we'd made our first book. I've opened books in that manner ever since. It looks like you have done a wonderful job, well done! 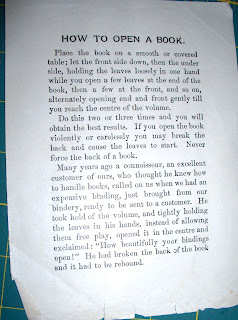 Instructions on how to "break in" a book, especially one that is Smyth sewn, are also found in a book I have called Books, Boxes & Wraps, by Marilyn Webberley & JoAn Forsyth. I had never heard of such a thing but was glad to know about it. thanks lisa, dolores, carol, acornmoon, and annebanan! You did an amazing job Rhonda! I think it would take a direct command from God to make me even try what you did! I'm sure the church is very pleased. I swear I heard that book cry! I will never open a book incorrectly again. I'm wondering if this is a later edition of the "John Brown Bibles" sold door to door in the 19-teens. Will you tell me the publisher? I have on in four volumes that belonged to my grandfather's first wife. hi textart, you may be right about that. I don't know. I cannot check the publisher, since I don't have the bible anymore. After it was repaired, I returned it.